The SF Bay Area chapter of the ACM's Computer and Human Interfaces group (BayCHI) invited me to give a talk tomorrow night in Palo Alto, CA. The topic will be: "The Back of the Napkin: How to solve complex problems with simple pictures." From a technical perspective, this show will be different than usual. Normally I present from my tablet PC, drawing directly on the screen and projecting the pictures live. This time I'm going to try someting else. Several months ago, I got a call from the creators of a digital pen system called PaperShow. I was dubious about the need for yet another clunky digital product to solve the "problem" of pen and paper, so I gave them a polite 'No'. (What that problem is will be a much longer discussion another time.) But after their fourth equally polite call I relented and agreed to meet product manager Giulia Carla Giovanelli and VP Bob Toth for a demo. I'm glad I did. Not necessarily because their digital pen is wonderful (that's what you and I will be testing tomorrow night in my talk; nothing like a technical trial-by-fire in front of a couple hundred people, right?) but because I learned about the history of Canson, the world's oldest art paper-maker. As a one-time art student and an all-time sketcher, I knew that Canson was French and made wonderful paper and artist's materials, but what I didn't know was the derivation of the Canson logo. It turns out to be a balloon. Canson was founded in 1557 by the Canson and Montgolfier families in Annonay, France. Anyone who knows art knows Canson, and anyone who knows flying knows Montgolfier, but what I never knew was the connection. The short story is that the two families founded the paper mill together, made lots of money and had big families, and sponsored lots of local and scientific events. When the Mongolfier balloon flew on November 21, 1783 carrying Pilâtre de Rozier and Marquis d'Arlandes it was the first time humans ever flew. After a 25 minute flight, they landed successfully and toasted their flight with a bottle of Champagne. I'm happy and honored that the company that provided the materials for humanity's first flight would ask me to demo their latest project. I hope to see you tomorrow night, and let's see how well PaperShow flies. * July 14 is Bastille Day, the French national holiday. How appropriate, n'est-ce pas? I just got back from DC where I shared my "solving problems with pictures" tools with the U.S. Senate. It was an eye-opening experience. Doug Steiger, New Policy Director of the Democratic Policy Committee, invited me to talk to the heads of staff of the Senators from the Democratic side of the aisle. About sixty of us met in hearing room 628 in the Dirksen Senate Building, across the street from the US Capitol. Since I normally consult with business executives, it was fascinating to talk about the challenges that political staff deal with daily. After all, this is Washington, and this is REAL politics. 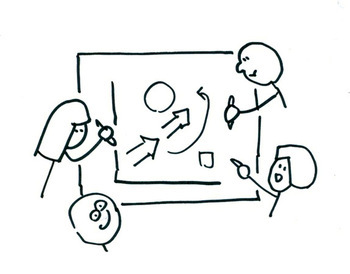 Whenever I give a workshop, I ask in advance for a sample problem relevant to my audience, so that I can demonstrate the power of pictures in a context drawn from their real-world experience. In this case, Doug supplied me with a thick set of economic data comparing eight years of the Clinton Administration with eight years of the George W Bush administration. SXSW: vote early and often! 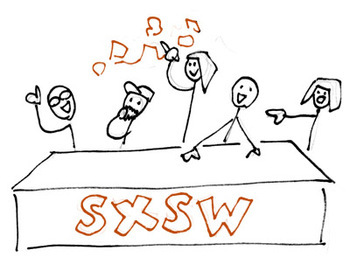 I had so much fun launching The Back of the Napkin at the SXSW conference last year that I'd like to go back to Austin again this year. 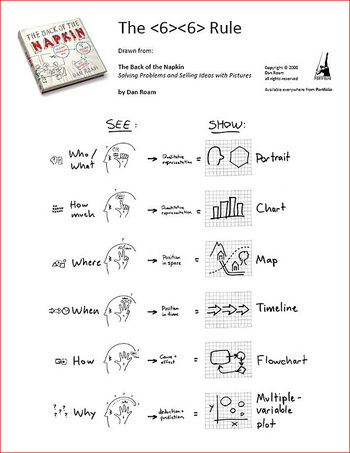 I've got a whole bunch of new visual thinking stories, tools, and concepts to share, but I need your help. To be accepted as a speaker at SXSW, you need to have people vote for your idea on the Panel Picker. I've got two events I'd like to do this year, and if you're interested in either, I'd love for you to vote for them. The first is a panel discussion called Shift Happens: Moving from Words to Pictures. Tom Crawford of VizThink has pulled together with me and the amazing Lee LeFever of CommonCraft, Dave Gray of Xplane, Sunni Brown of eyescience, and visual facilitator Marilyn Martin. We'll be sharing ideas about how pictures are taking over the world. Should be cool. Why computers are killing our ability to see the obvious. 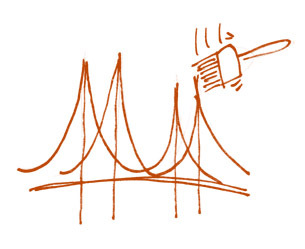 Why making things simple has become so complicated -- and how to make the simple simple again. The neurobiological reasons why a hand-drawn sketch is always more compelling than a slick presentation. Anyway, it should be a lot of fun. There are about a zillion other great panels too, so check them out and vote. Again and again! DANGER! DANGER! Voting deadline is Aug. 29! Since the publication of The Back of the Napkin, many people have asked when and where they can attend my visual problem-solving workshops. I'm been pretty booked at private business events, so it's tricky to schedule open workshops. 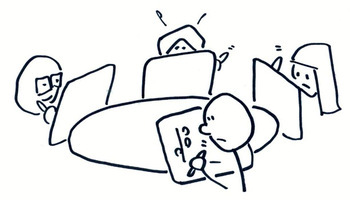 But on Sept. 11, 2008, Gartner has asked me to lead a half-day "Back of the Napkin" workshop as part of their Gartner BPM Summit in Washington DC. This workshop will be available to anyone attending the full conference, so if you'd like to know more about how to solve problems with pictures, this is a good opportunity. 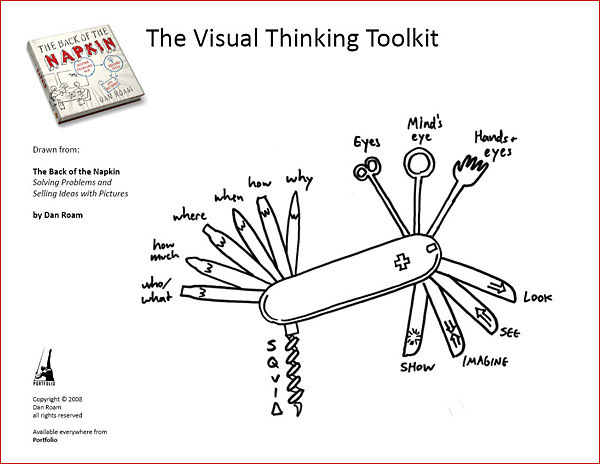 With these tools in hand, you will be able to start solving any problem (BPM or otherwise) with a picture immediately. To attend, you'll need to both register for the conference and register for my workshop (an additional fee of $100). 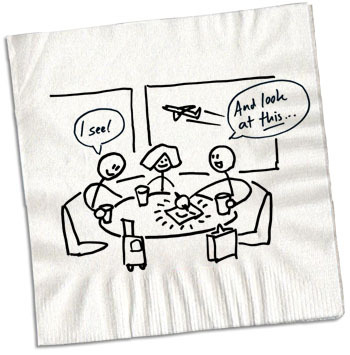 Napkin teleseminar with Seth Godin, Anil Dash, and Rich Sloan -- now this is going to be fun! 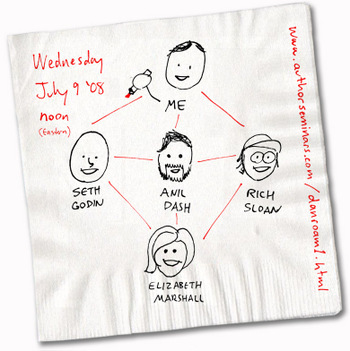 Thanks to Elizabeth Marshall at Author Teleseminars, on July 9 at noon EST I'll be giving a live Back of the Napkin session online with Seth Godin, Anil Dash, and Rich Sloan. Please join us live on Wednesday, July 9 at noon eastern. You can sign up here. Have your pen and napkin ready! Thanks to the interest and generosity of the folks at Google, it was my turn last week to head down to the Googleplex and talk about solving problems with pictures. It was a lot of fun to talk with such an engaged crowd. In his wonderful book Presentation Zen, Garr Reynolds talks about the critical need for a speaker to get a feel for his or her audience. Since I've done a fair amount of work with Microsoft lately, it was fascinating to compare the difference in audience responses between these two out-for-blood competitors. Quick takeaways: the Google crowd is much younger than you see at Microsoft up in Redmond, and the whole place feels infinitely more like a college campus. My favorite thing? The huge whiteboards everywhere... and the crazy beautiful Google Earth mashups on display in the lobby. 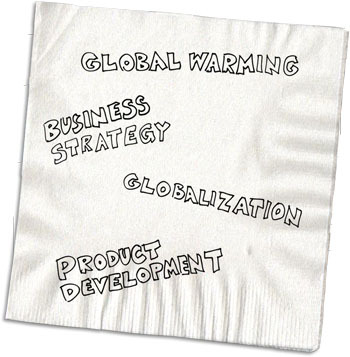 I recently shared several on-air napkin business sketches with Poppy Harlow at CNNMoney.com. 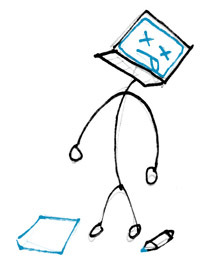 The first to air is my sketch of the ongoing Microsoft-Yahoo-Icahn story. I've come up with a quick picture that I think explains the story clearly and sets the scene for what's likely to come next. Watch the CNN clip here. Upcoming napkin sketches include airline mergers and why Starbucks is in trouble. 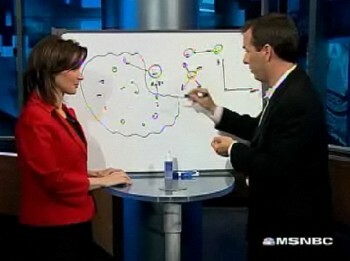 Stay tuned for those and other whiteboard sketches on CNNMoney.com. As host of MSNBC's "Your Business" show, it's not surprising that JJ Ramberg is really smart; if you're going to run a nationwide business program, you'd better be. But what amazed me most about JJ when we shot a program the other day at 30 Rockefeller was how quickly she saw the power of pictures as a way to convey complex business concepts -- even though she's an admitted "terrible drawer". JJ was just a little skeptical as we chatted before the cameras rolled. 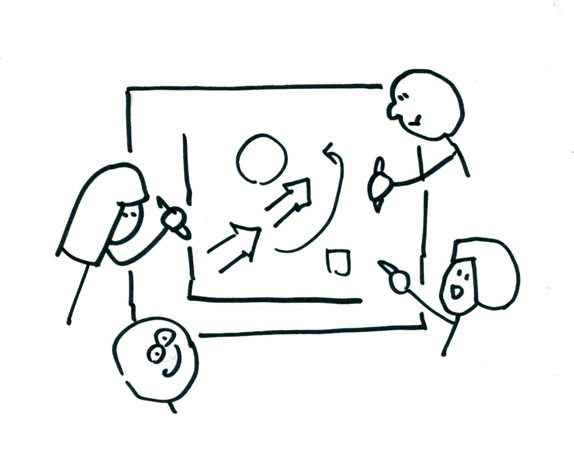 But once we got going and she challenged me to illustrate a typical small business marketing challenge, she got it immediately... and when our episode was done, I noticed her sketching circles and arrows on the back of her notes. Aside from hosting MSNBC, JJ also runs her own businesses, and it turned out that she was sketching an idea that came to her during our show. Hmm... helping an on-air personality find a new way to look at problems while ON-AIR: that made me feel pretty good about how well back of the napkin sketches work. When the Fox Business Network asked me to join them for a visual thinking session, I was surprised by the address: the Bull and Bear Bar at NY's Waldorf Astoria. It turns out that's where hosts Rebecca Gomez and Cody Willard hold court for the network's "Happy Hour" segment. The first official conference of "visual thinkers" from around the world begins tomorrow right here in SF. 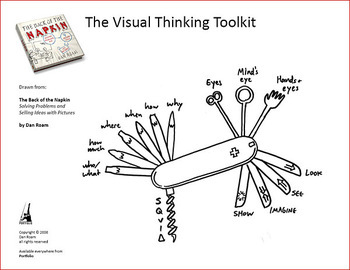 Held this Sunday through Tuesday at the The Westin San Francisco Market Street, VizThink08 is the brainchild of VizThink CEO Tom Crawford and Xplane's Dave Gray. The lineup of presenters is literally the 'who's-who' of visually-oriented communicators, from Nigel Holmes to Scott McCloud, from Karl Gude to Nancy Duarte. With 350 attendees coming from around the world and sponsors from Microsoft to Wacom, it promises be an eye-opening conference. 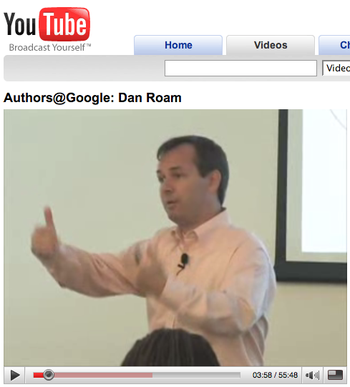 I'm happy to say that my own name also appears on that otherwise stellar list of presenters. 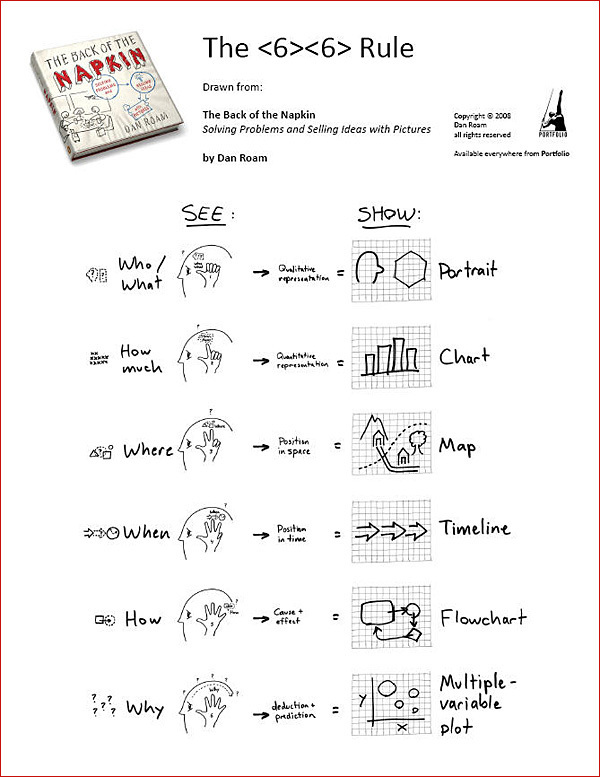 Yes, at 11:00 on Monday, Jan. 28, I'll be leading my "Back of the Napkin" workshop, helping participants learn to solve problems with pictures. 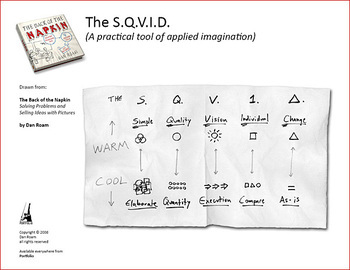 More details on VizThink here (blog) and here (wiki). More details on my workshop here. Hope to see you there.